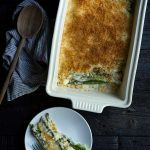 Asparagus gratin is a fantastic spring side dish that highlights one of my all time favorite vegetables! It’s cheesy and savory, with just the right amount of crunch from panko breadcrumbs. Aged gruyère adds a rich nutty flavor. This post is a paid collaboration with Emmi USA. 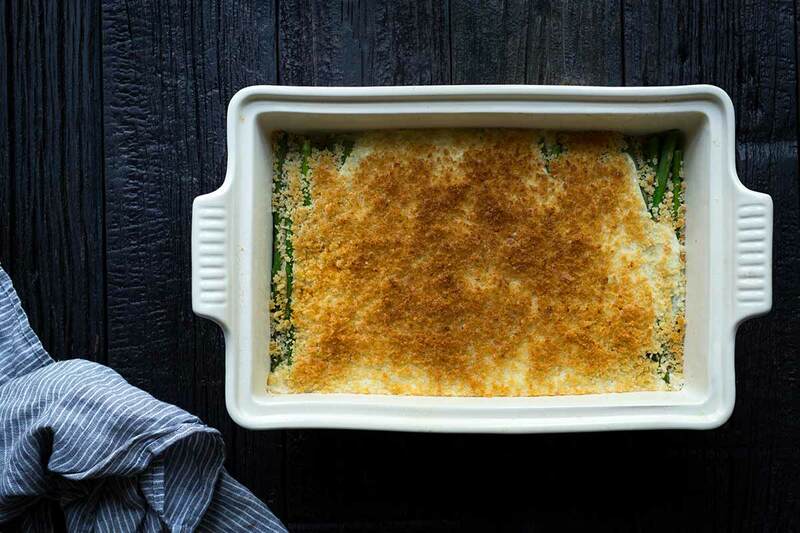 If you love potatoes au gratin, you’ll love this lightened up asparagus gratin recipe. I absolutely love pairing cheese and asparagus together. There’s something about the bright, earthy flavor of asparagus that lends itself especially well to aged cheeses with nutty flavor profiles like gruyère. I’ve once again teamed up with Emmi USA to create a recipe using their incredible Kaltbach Le Gruyére, which I fell in love with when I used it in a warm zucchini salad. It has more depth to it than your standard gruyere cheese, and luckily it’s available at my local grocery store. 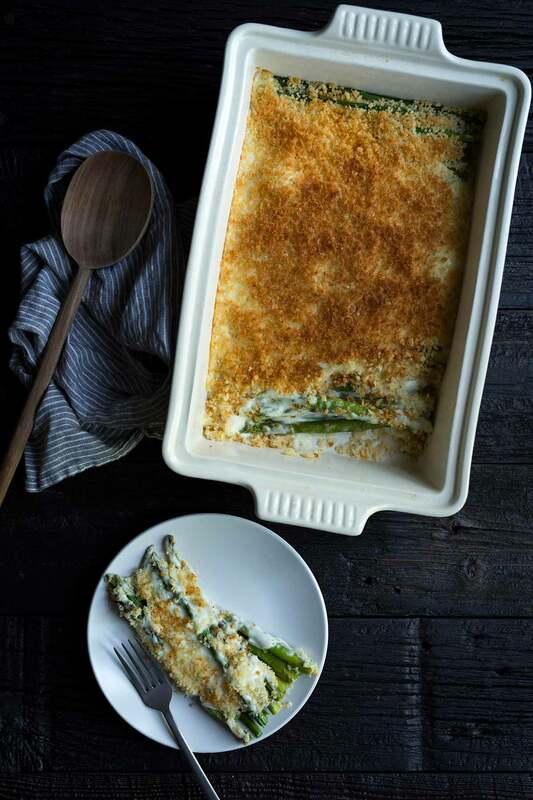 This asparagus gratin recipe is made using a classic bechamel sauce. If you’ve never made bechamel before, have no fear. It has a fancy French name, but is very fast and easy to prepare. Bechamel is one of the five French mother sauces. Have you ever made homemade macaroni and cheese? You may have already prepared bechamel sauce without realizing it! 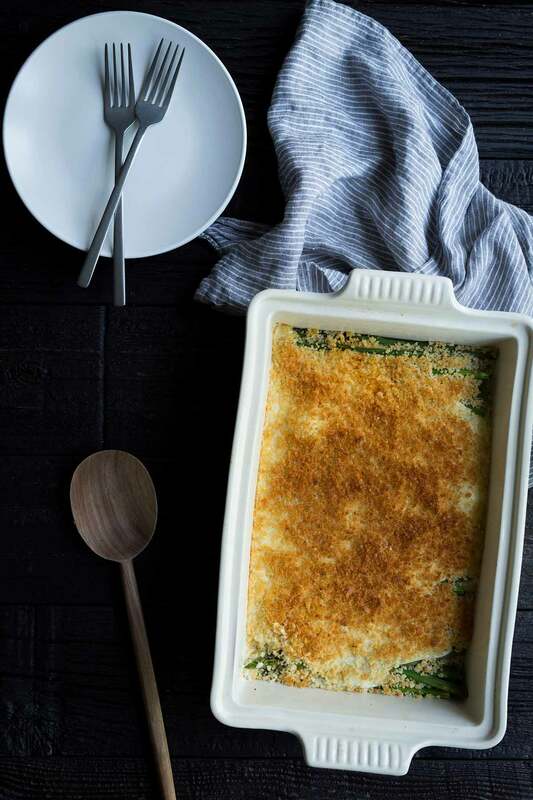 It’s the base for cheese sauces, such as the one used in this gratin recipe. Bechamel is made by whisking together equal parts flour and butter in a saucepan for several minutes to create what’s known as a roux. Milk is then added and whisked over high heat until the sauce thickens up. Salt, pepper, and sometimes other seasonings are added. Voila! To turn bechamel into a cheese sauce, you simply whisk in grated cheese. It’s best to remove the cheese from the heat first, since too much heat can cause the cheese to separate and become gritty. 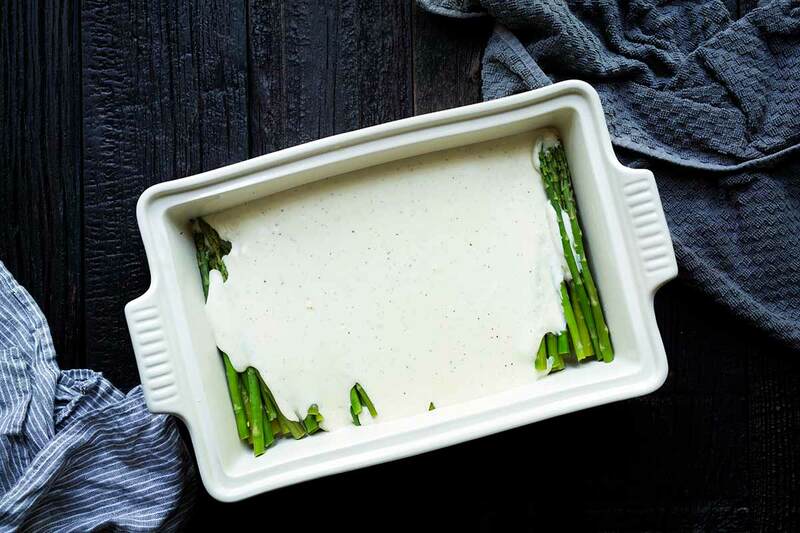 That, my friends, is the sauce for this glorious asparagus gratin. Buttery breadcrumbs add just the right amount of crunch. I use the broiler at the end to get them nice and toasted. The results are absolutely decadent. The final recipe is so much lighter than the classic gratin using potatoes, making this a perfect spring side dish. Looking for more recipes highlighting cheese? Be sure to check out my classic swiss fondue (with tips on how to host a fondue party), and my warm zucchini salad! 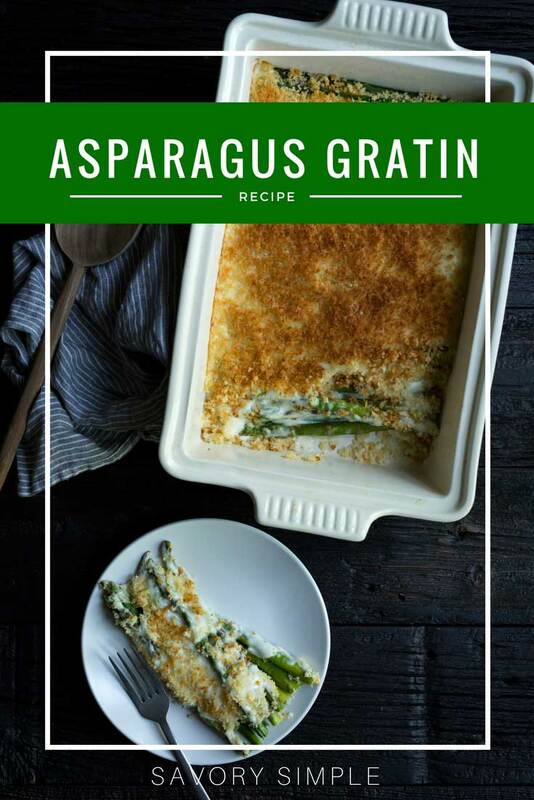 Asparagus gratin is a lightened up version of potatoes au gratin that's a perfect way to celebrate seasonable asparagus! Place an oven rack on one of the top two shelves, then preheat the oven to 400 degrees F. Grease a 3 or 4-quart casserole dish with cooking spray, butter or olive oil. Bring a large saucepan of salted water to a boil. Cook the asparagus, in batches if necessary, until crisp-tender, 3-4 minutes depending on the thickness of the asparagus. Drain through a colander, shaking off any excess water, then transfer to the baking dish. Toss with 1 teaspoon salt and 1/2 teaspoon pepper. In the same pot, melt 3 tablespoons butter over medium-low heat. Whisk in the flour and cook, stirring, until the mixture develops a nutty fragrance and darkens slightly, 2-3 minutes (this is known as a roux). Whisk in the half-and-half, 1/2 teaspoon salt, and 1/4 teaspoon pepper, then increase the heat to medium-high. Whisk until thick, 4-5 minutes. Remove the sauce from the heat, then add the cheese in handfuls, whisking until smooth. Pour the sauce evenly over asparagus. Melt the remaining 2 tablespoons butter in a small skillet, then stir in the panko and 1/2 teaspoon salt. Sprinkle over the cheese sauce. Bake for 10 minutes, then turn on the broiler. Broil for 1-2 minutes, or until the breadcrumbs are golden brown (watch closely to make sure they don’t burn). This is my kind of dish Jennifer. That gruyere! A favorite! Can’t wait to add this to our menu! Everything is better with cheese! This sounds like a wonderfully decadent side or even a light standalone snack / lunch. Ooh, such a timely recipe! I “almost” picked up some asparagus in the market today—but will on my next trip as the Gruyere is already in the fridge! Such an elegant spring side dish! This is the perfect way to treat asparagus. Yum! What a gorgeous way to serve asparagus! 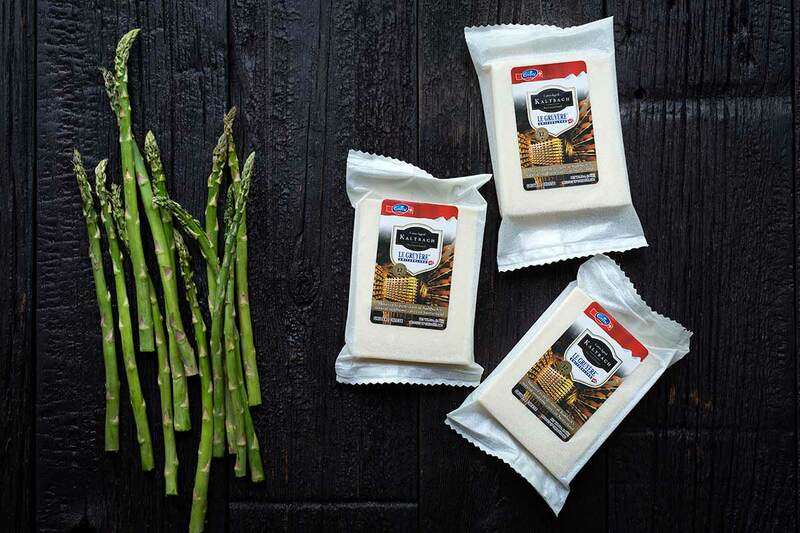 Same – cheese and asparagus is like PB&J for me. This looks wonderful! Pretty sure I would LOVE this.